Textiful allows you to fully customize the messages that are sent to your audience asking them for their email addresses and other information. How you customize these messages will depend on the shortcode that your keyword is using. To access your keyword messages and settings, click on the "Keyword" tab in the main navigation. Next click the "Edit Messages & Settings" button for the keyword that you would like to edit. Click the "Collect Email" tab in the left hand navigation. This tab will allow you to customize the message which asks your users for an email address. There is a 160 character limit for your message. Be sure that the message is clear that the user should reply with their email address. Sometimes users don't reply with their email addresses for one reason or another. You can setup a friendly auto-reminder text that will be sent to those that did not provide an email address after a designated amount of time. This follow up message feature can greatly increase conversion rates. To enable, check the box labeled "Send an automatic follow up text message", set the time delay and customize your message. Your message will be sent to those that have started the enrollment process but have not yet provided an email address. When the user replies with their email address, it will be captured and the confirmation message will be sent. The 444999 keywords have a more customizable setup and are able to collect other information - like first and last names - directly from your audience. To customize the data you're collecting and their associated messages, click the "Data Requests" tab in the left hand navigation. 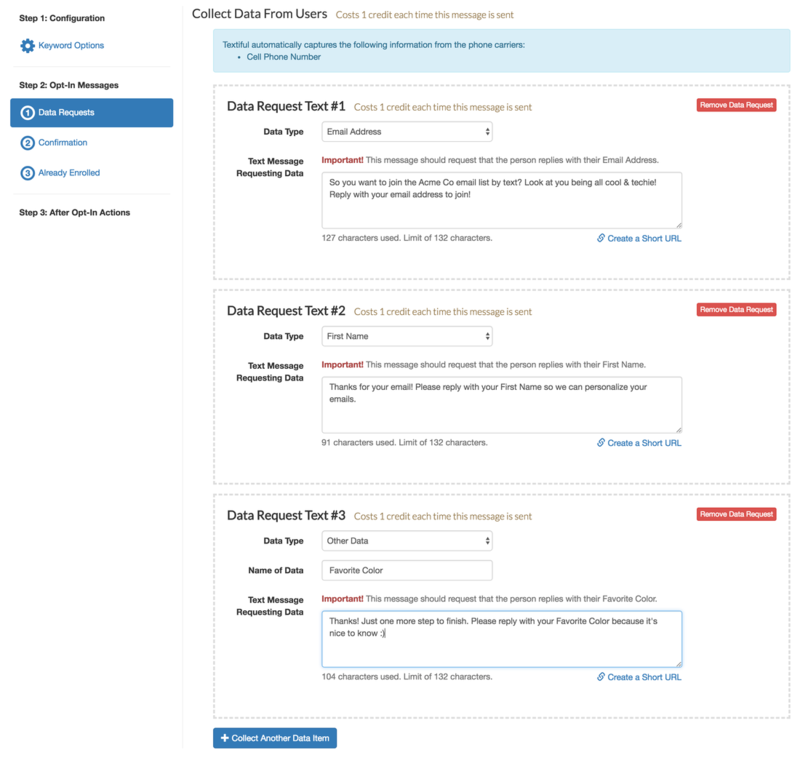 You will see multiple boxes labeled Data Request Text. Each box represents a different piece of information that you will be asking your audience. To ask for more information, click the "Collect Another Data Item" button. In the example below, this keyword is asking for an Email Address, then their First Name and finally their Favorite Color. By selecting "Other Data" in the dropdown, you can collect your own custom data type. When the user first texts this keyword, they will receive the first message asking for their email address. This message will come from a different number than 444999 (usually 24411). This is so their answers aren't confused with another organization's keyword. Once they reply with their email address, the next data request message asking for their first name will be sent. When they reply with their first name, the final message asking for their favorite color will be sent. With the 444999 shortcode, there is no limit to how many different data messages you can request of the user. Keep in mind that each outgoing data request requires 1 credit in order to send. The confirmation message is sent as soon as the user completes the enrollment. For 345345 keywords, it will be sent after they provide their email address. For 444999 keywords, it will be sent after they provide the information for the final Date Request Item. If you are not collecting any information from the user, the confirmation message will be sent as soon as they text your keyword. Confirmation messages can contain links to a website. It is recommended to use a URL shortening service. Click the the "Create a Short URL" link below the textbox to generate a new short URL. Or you can use a separate service - like Bitly - and paste the short URL into the text box. The already enrolled message will be sent to users who have already enrolled and text your keyword a second time. This is helpful to let the user know that they have already completed the enrollment process. Already Enrolled messages can also contain links to a website. It is recommended to use a URL shortening service. Click the the "Create a Short URL" link below the textbox to generate a new short URL. Or you can use a separate service - like Bitly - and paste the short URL into the text box.